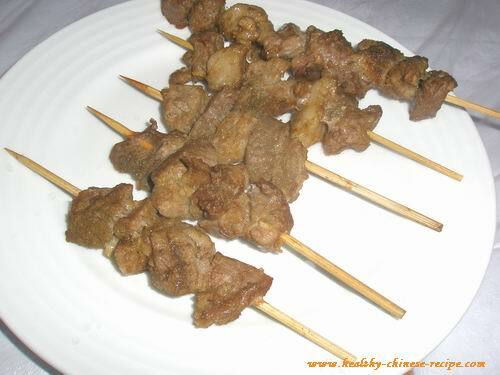 Lamb kebabs or mutton kebabs, originated from Xinjiang, are one of very popular street snacks in China. It's also welcomed in bars and restaurants. It's such a delicious food that many beautiful girls eat beside street regardless their images. In this recipe, I added cornstarch and olive oil. This can make lamb meat tender and soft. It's good for those who have cold-related disease. But don't eat too much. 1. Wash lamb meat, take out fat. Cut both fat and lean meat into 2cm long small cubes. Marinate meat in marinade sauce overnight, or 30 minutes in fridge. 2. String the lamb cubes on skewers. Put a piece of fat between two lean meat cubes. (but don't eat). Preheat oven at 200C. Grill for 15 minutes on two side. Or roast for 7 minutes on one side and another 7-8 minutes on the other side. 3. Sprinkle some dip powder, serve. Tips: The fat meat will increase the flavor and moisten the lean meat. But you can throw away them when serving.